Snake identification isn't always the simplest task, particularly if you're a little too squeamish to get up close and personal with the specimen. The variety of habitats in East Texas, and particularly the piney woods, encourage a great diversity in the species found in the area. While it's sometimes impossible to rely on one characteristic for a positive ID, gathering as much information about the snake as possible can lend greatly to identification. East Texas isn't short on venomous snake species. Several pit vipers call the area home, along with the venomous, non-pit viper eastern coral snake. Fortunately, knowing a few characteristics of pit vipers and coral snakes can help you quickly determine the danger level of an encountered snake. Pit vipers have vertical pupils and a somewhat conspicuous pit near their nostril. Their heads are triangular and wider than their bodies. 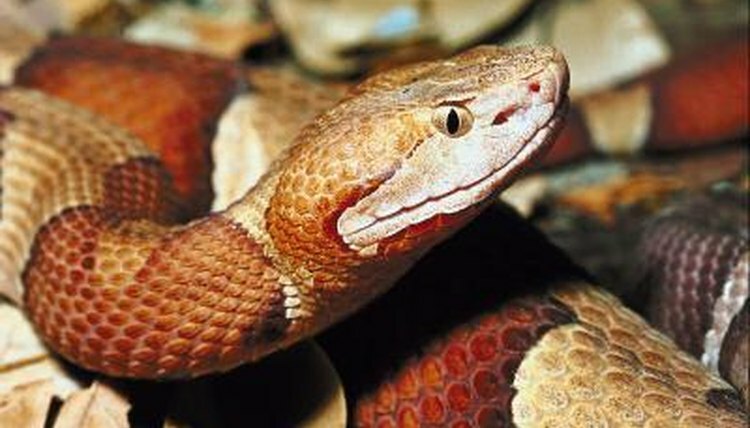 Rattlesnakes also possess a scalelike tail, cottonmouths have a cottony white interior of their mouths and copperheads have a colorful pattern. Pit vipers have hinged fangs that swing forward. The coral snake, on the other hand, doesn't have any of these characteristics. It is a fixed-fang snake, closely related to cobras. Its pattern, however, can help you distinguish it: thick red and black bands separated by yellow stripes; the yellow and red touch. Size can help you determine the species you're dealing with, although it's not the only characteristic to rely on. Some East Texas snakes are particularly large. The Texas rat snake, for example, grows more than 6 feet at maturity and the record length for this species is over 7 feet. The largest venomous species in East Texas is the timber rattlesnake, which averages 4 feet but can reach over 6 feet. Pigmy rattlesnakes average about 1 1/2 feet long. The western ribbon snake can grow up to 50 inches long. To use size in determining species, make the best estimate you can based on objects near the snake -- especially if you can't or won't get close enough to measure it! A snake's pattern -- or lack thereof -- can help you in identifying different species, although you shouldn't rely on the pattern alone for identification because many species have similar patterns and colors. The coachwhip, a particularly long and slender snake, has small or thin white blotches or crossbars across its tan, gray, pink or reddish body. The brown snake, on the other hand, rarely grows over 15 inches and is grayish-tan with a lighter brown stripe down its back that is speckled with black blotches. Many of the area's garter snakes, including the abundant western ribbon snake, have dark bodies with conspicuous, bright yellowish stripes running the length of the body. Where you find the snake can be an integral clue in finding out what species it is. Some snakes prefer the lowlands of East Texas, while others prefer the higher coniferous forests. The coachwhip is particularly fond of upland deciduous forests, while the brown snake and water moccasin are more fond of lowland floodplains. Rat snakes are particularly adaptable and will live anywhere where rodents or other small prey is abundant. The Southwestern Naturalist; Species Diversity and Seasonal Abundance of Snakes ... Eastern Texas; Neil B. Ford, et al.